Unicia R. Buster is an award-winning textile artist and graphic designer from Richmond, Virginia. She has won a Visual Arts Fellowship from the Virginia Museum of Fine Arts, second and third place awards for graphic design from the Virginia Press Association, and a “Best in Show” award in the National Arts Program. A professional artist for more than 15 years, Ms. Buster’s work has been featured on NBC Channel 12 local news and in the Richmond Free Press, the Richmond Times Dispatch and Style Magazine. Ms. Buster received her Bachelor of Fine Arts degree from Cornell University and her Master of Arts degree from George Mason University. She has exhibited in numerous cities including Richmond, VA; Washington DC; Long Island City, NY; and Rome, Italy. 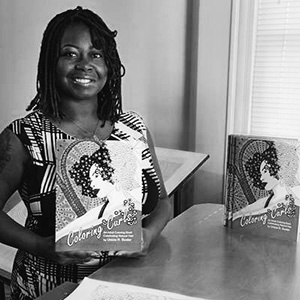 Ms. Buster is the illustrator of “Coloring Curls” and “Coloring Curls 2” both adult coloring books. She also has created several series of artwork including the “My Hair Naturally” series which celebrates the beauty of natural African-American hair. Ms. Buster enjoys meeting new people and draws inspiration from these encounters.